You’re staring down at a huge three-ring binder. Page after laminated page is stuffed with two-column type, blurry with song titles, alphabetically taunting you. Or worse, your friendly karaoke jockey says “you can pick anything to sing – we have it all.” You’re paralyzed by too many choices. Sometimes the most daunting challenge to a casual karaoke singer can be choosing the right song. You don’t want to go down in history (or Facebook) as the one that killed the party. You want to have fun and get the crowd to have fun with you. 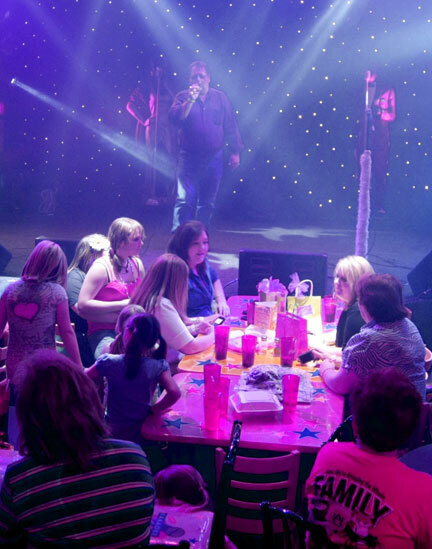 Here are some tips from a veteran karaoke singer. First off, take a few minutes to listen to what everyone else is singing, and how the crowd’s reacting. For instance, if you’re at Bob’s Wagon Wheel, chances are you’ll need to pick from one of their two kinds of music (country and western). Once you get a feel for the groove, choose something along the lines of what the crowd’s already having a good time with. Older crowds might prefer 80’s pop or rock, while a younger set won’t know Men At Work from Men Without Hats. If the crowd’s really young, ask the KJ for his sheet of new releases – those aren’t always added to the KJ’s main books right away. Some crowds are more open-minded, and are delighted when the singer thinks outside the box, an attitude generally lubricated by adult beverage consumption (theirs, not yours). If you’ve looked at your song choices and decided you have to go against the grain, wait until grain alcohol has a chance to kick in. Now you’ve narrowed things down to a genre, start looking at songs you already know the words to. That will add a lot to your confidence, which will show up on stage, and you won’t appear to be locked in a staring contest with the monitor displaying the lyric wipe throughout your performance. Avoid songs that require a lot of range – swooping from high to low and back again. Your friendly KJ can change the pitch of a song to lift or lower it so it fits your voice better, but that won’t help if both the lows and the highs are out of your range. If your range is super-limited, you might consider songs from singers who seem to deliver their lyrics in a monotone. If you’ve followed the tips above and still can’t decide, you can always pull out a few of the classics. These are karaoke tunes that seem to go over well most of the time, for most people, and aren’t terribly difficult to sing. Joan Jett’s “I Love Rock And Roll” has a great sing-along chorus, and Dolly Parton’s “9 To 5” (especially the Chartbuster Karaoke version) will please both a country or a business crowd. For those in a flirty mood, Van Halen’s “Oh, Pretty Woman” is a great go-to (and you can kick it old-school with the Roy Orbison version), or whip out The Weather Girls’ “It’s Raining Men” if that’s your target. Just go easy on the suggestive dance moves, unless you’re planning to supplement your income with the dollar bills stuffed into your underwear. One giant potential landmine at karaoke night is the ballad. While we love the slow-burn as much as anyone, especially in the middle of a breakup, it’s not the best way to get the karaoke crowd on your side. Save them for a more dramatic moment. Ballads tend to be “down-tempo”, which is musician-speak for “massive buzzkill”. But if you must succumb to the need to bare your tortured soul on stage, or declare your undying love for another, choose a tune with a bit of kick to it. Alanis Morissette knows how to do this, and so does Carrie Underwood. It’s also perfectly fine to hit up the friends who brought you to karaoke night to help you pick out a song. You’ll have more fun poring over that song list with the rest of your posse anyway. Even better, when they all declare that something outrageous is exactly the song to pick, you can look them squarely in the eye and dare them to perform it with you – as a duet! There are a few tunes out there in karaoke land that are truly awesome, but just don’t work for karaoke. These are songs that are generally too long, or that involve long instrumental breaks. While the urge to drag your high school sweetheart onstage to perform “Paradise By The Dashboard Light” may be strong, you may find yourself playing to an empty stadium before the baseball announcer kicks in. And while Don McLean’s excellent “American Pie” is a classic, it also had to be broken into two parts for the single release. If you’ve followed all the tips above and still can’t find a song to sing, you’ve still got an exit strategy. Tell your karaoke jockey that you want to start a round of Kamikaze Karaoke (sometimes called “Karaoke Roulette”). When it’s each person’s time to sing, the KJ will load up a totally random song, and the person on stage gets to sing it whether they know the song or not. If you’re using DigiTrax Entertainment’s Karaoke Cloud for streaming or downloading your karaoke, just spin the mouse wheel. If you’re mobile, just fire up Sing-N-Share and swipe the screen to spin the wheel of choices (with the added side benefit of being able to post your awesome creations to your Facebook and/or Twitter feeds). Now, you’ve leveled the playing field. This entry was posted in Karaoke News and tagged 9 to 5, Alanis Morissette, American Pie, Blue Oytser Cult, Carrie Underwood, chartbuster karaoke, country, Digitrax, Dolly Parton, Don McLean, Don't Fear The Reaper, download, How To, I Love Rock And Roll, It's Raining Men, Joan Jett, karaoke, Karaoke Cloud, Meat Loaf, Men At Work, Men Without Hats, new release, Paradise By The Dashboard Light, Pretty Woman, Roy Orbison, streaming, The Weather Girls, Van Halen, western. Bookmark the permalink.